V ital Link has focused on military and sheet metal engine test enclosures from its beginning in 1990. No test cell company can match Vital Link’s Hush House experience. Over the past 30 years, our key personnel have concepted many improvements, some of which have been patented. In January 2017, Vital Link joined Celtech in the Atec family of companies. In June 2017, Astronics Engine Test Systems joined our companies as Naval Engine Test Systems (NETS). Together, we have over 100 engineers in our engine test enterprise; 50 of these engineers would be fairly classified as subject matter experts. No other commercial organization can claim our combined military engine test background. Our performance for the USAF is highly ranked, and we expect to expand our performance for the US Navy and Marines with technology refreshments through NETS. Metal Test Cells to test the advanced high thrust Fighter Engines for 2 NATO Airforces in the European Theater. This will be the most advanced hush house ever built, with scalable acoustic treatments and proven, modern subsystems throughout. An Engine Test Cell modifications project for a NATO Ally in the Eurasian region. Vital Link’s top rank skills in modification skills will be showcased in this dramatic upgrade of an existing noise suppressor to accommodate the Worlds’ Most Powerful Fighter Engine. Fabrication of exhaust & structural components and installation assistance for Atec’s expanded Phoenix modular Bizjet test cell for Duncan Aviation at Lincoln, NE. Joint Strike Fighter T9 Hush Houses for the USAF at Tinker Air Force Base in Oklahoma City, with new adapter and utilities. The Advanced T10 Hush House for test of GE F110 engines at Dubai for the UAE Air Force. Large Engine Exhaust system for test of Pratt & Whitney’s Geared TurboFan engine in Florida. Development of the double-wide exhaust augmentor with collector for test of F18/F404-414s for the USN at JAX. Development of state of the art noise packing (basalt wool/ESAK) and vibration resistant fasteners for long service exhaust augmentors and hush house panels. Novec and other advanced fire suppression agents incorporated into the most modern delivery and electronic management systems for test cell fire suppression at dozens of locations worldwide. 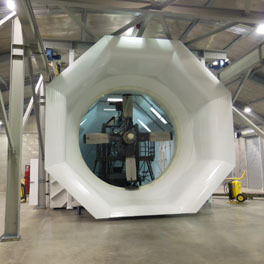 Revamp of 10 meter CF6 turbofan test cell for USAF at Dover, MD.